The dial is located next to the photo button, it lets you easily switch between camera modes. Swap between modes by turning the dial. Alternatively, you can tap the centre of the dial to enlarge it before turning it to select a mode. Tap the centre again (or anywhere outside the dial) to minimise it. Long press on the centre of the dial to bring up the controller menu. These modes are completely customisable, most settings will be stored separately for each mode. 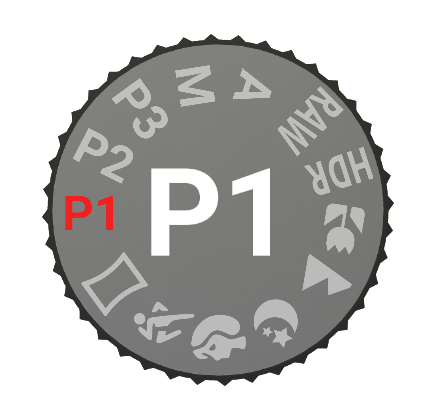 Use P1, P2 and P3 to store camera configurations you use regularly. Use P1 for everyday use. If your phone supports manual focus, exposure or ISO, this mode will appear on the dial. (manual exposure and ISO are only available when using the Camera 2 API). Use the sliders to change manual controls. This mode sets focus and scene mode to auto. Use it if you want a basic mode that should always work. If your phone supports RAW (Dng) snaphots, this mode will appear on the dial. RAW is supported on most phones with Camera 2 and some with Camera 1. HDR is supported on all phones but will be faster when using Camera 2. This scene mode is for taking photos of close objects, it enables macro focus mode. This scene mode is for taking photos of far away objects, it enables an infinity focus mode if possible. This scene mode is used for taking photos in low light, it usually allows a longer exposure time. This scene mode is optimized for still photos of people. This mode is optimized for photos of quickly moving people. Switches the camera to panorama mode. P1, P2, P3, RAW, HDR and Manual each have individual settings while Auto, Macro, Landscape, Night, Portrait and Sports all share the same settings.